Just finished: Richard Flanagan’s Narrow Road to the Deep North. Still mulling reactions to this book. 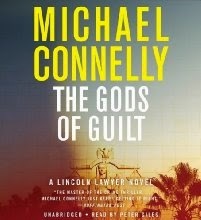 Listening to: Michael Connelly’s The Gods of Guilt. Criminal defense attorney Mickey Haller, the Lincoln Lawyer, so-called because he works from back of a Lincoln Town Car, defends a virtual pimp who is accused of murdering one of his clients, a prostitute. The prostitute happens to also be one of Haller’s former clients – a woman he connected to. The Gods of Guilt came out in 2013. I was reminded of it when I picked up Connelly’s 2014 offering, The Burning Room. In that, Harry Bosch, a detective working what is likely one of his last cases mentors a rookie who shares some of the work motivations of his own past. Love Connelly for his characters, his plots, his themes. I’m particularly moved by descriptions of the way life used to be, a time just passed in general and at specifically at newspapers – whose hay days are over. Connelly’s a former reporter at the LA Times. I worked at a small Maine newspaper. The Burning Room is a passing-the-torch book. I only wish Connelly wrote more than a book a year. I need his excellent but easy-to-read writing to punctuate some of the tougher stuff I take on. Haven’t found any detective novels I like as well. Next Up: For book club Jess Walter’s Beautiful Ruins. Also in line David Mitchell’s Bone Clocks. Interested in: Emily St. John Mandel’s Station Eleven. Presently rereading: The Yoga Sutras of Patanjali, Translation and Commentary by Edwin F. Bryant, a text that was used in my Yoga Teacher Training class. I love Michael Connelly too. I worked at a small newspaper in southeastern Pennsylvania and maybe that's why I relate to him as well. I don't know, but whatever it is, he's one of my favorites, if not my favorite crime fiction writer. The Harry Bosch series, to me, only had one bump in it but unlike other crime fiction series, it hasn't "lost it." Yes. I like the Bosch series the best. Hasn't lost it is a good way of putting it. There are other writers I used to follow that I don't even bother with. I don't care if I ever read another Patricia Cornwell book in my life and once I used to look forward to her books. I love Michael Connelly too! It's so good to see you blogging again, Barbara. I'm interested to read your take on Bone Clocks. I'm also reading a book on yoga, as one of my goals for the year is to get back to my yoga practice. My body has seriously declined without it! Glad to see you again. What yoga book? Problem with reading about yoga is that one can put off doing yoga as I know only too well.